Moll is fast coming to a grave end. She’s been apprehended by Sir John Gonson, imprisoned for her profligate ways, and thrown in the hemp workhouse with the rest of “her kind” (presumably said with a sneer and a slimy smile). Sneering, indeed, was the chief way Moll achieved her fame with the living, breathing public that consumed her. The public loved her–and by her I mean every country girl turned whore by ill luck and toes up fate. She was an object of derision, of pity and glances staying only so long as to see her rise and meteoric fall. What was Moll but just another low woman treading the worn path of death? One foot into the Bell Inn and her destiny was already shaped, be it through the usual killer, the pox, or by hanging once her fading looks forced her into thievery. Although Bridewell was mainly a prison for women, the gentleman to her left gained his hemp duty due to cards. They’re on the floor, shredded in half near the relaxed dog that seems to mind not the least the beating of hemp. The woman and two girls to his left are likely his family, imprisoned alongside him until they’ve earned back his debt. The larger of the two girls doesn’t look entirely fit for the workhouse, perhaps suffering from a physical condition or a mental illness, but neither she nor the pregnant woman further down can expect full reprieve. Going round the room, Moll’s servant is relishing this moment, we might say with schadenfreude. Instead of sympathizing with the her mistress’ plight, she’s grinning while adjusting Moll’s worn stocking on her thick legs. While also sitting. What earned her this privilege (or is Moll just the bigger fish?) 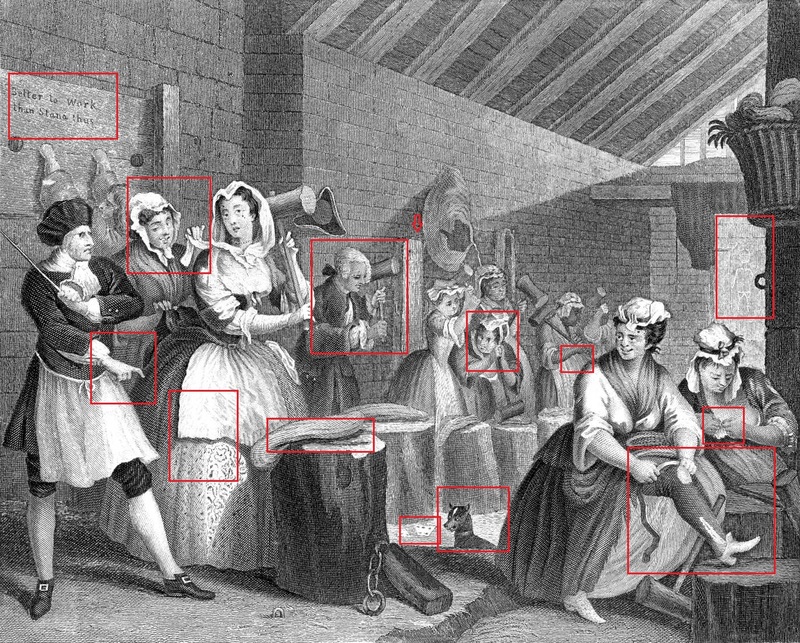 and why is the mobcapped woman beside her occupied with scraping Moll’s lace? Aside from the unfortunate persons populating the room, another aspect of interest–which unfortuantely fails to show in the picture–is the rudimentary hangman drawing beneath the window. The name “Gonson” is written nearby. Gonson, if you remember, was the magistrate from the Society for the Reformation of Manners. He hauled Moll in and if we are to infer anything by his cartoonish state, the prisoners, notably harlots, blame him for their current predicament. A placard stating “The Wages of Idleness” (translation: how all the prisoners got here), takes another aim at Moll’s real sin. For the first time since her arrival in plate 1, she’s wearing her work apron. The hemp she’s forced to beat is just one of the various tasks in the workhouse, but it may have further signifance because hemp was used for the hangman’s noose. Not only that, it’s tough, lacerating the neck when used to choke or hang someone. Given that Moll’s outlet outside prositution is thievery as suggested in her association with James Dalton in plate 3, would she possibly have pounded the hemp that would one day end her life? Circumstances lead her elsewhere but like everything Hogarth, there’s a little irony involved, isn’t there?